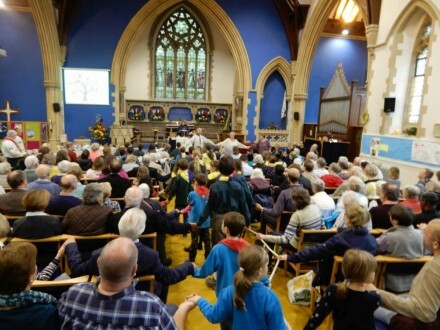 At Trinity the annual Church in Abingdon Lent Lectures came to an end on Monday. 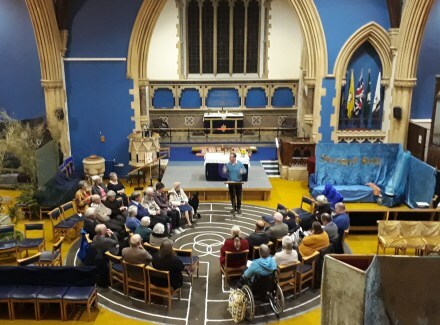 The church has been reconfigured for Experience Easter this week and so the lecture took place on the Labyrinth. 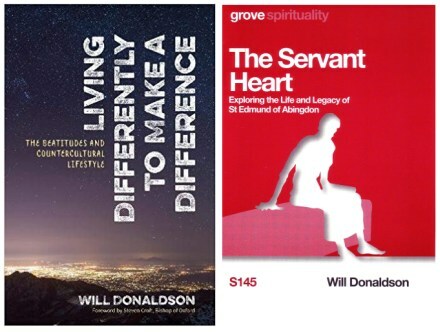 Will Donaldson gave the lectures based on his book about the Beatitudes: Living differently to make a difference. Will Donaldson is the chaplain at St Edmund Hall in Oxford. St Edmund Hall was named after St Edmund of Abingdon, and Will has also written a book about St Edmund of Abingdon called The Servant Heart. The front cover shows the statue of St Edmund in the grounds of St Edmund Hall. 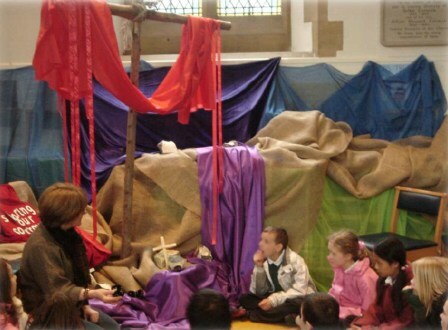 Lots of school children will be going to Trinity this week for Experience Easter – a series of workshops, specially developed by Trinity Learning to allow KS2 students to follow The Easter Story in a meaningful way. This will be the tenth year of Experience Easter. 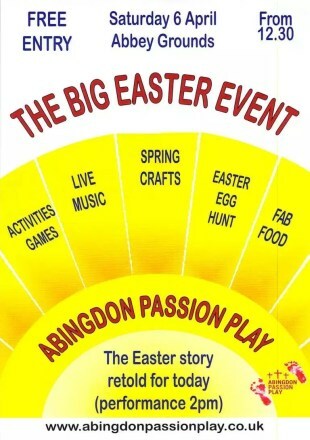 In ten days time on 6th April 2019 the Abingdon Passion Play is happening. There will be other activities, including an Easter Egg Hunt, before the main performance at 2pm. Just over a week ago the builder handed back the keys to Abingdon Baptist Church after an extensive re-ordering of the interior. 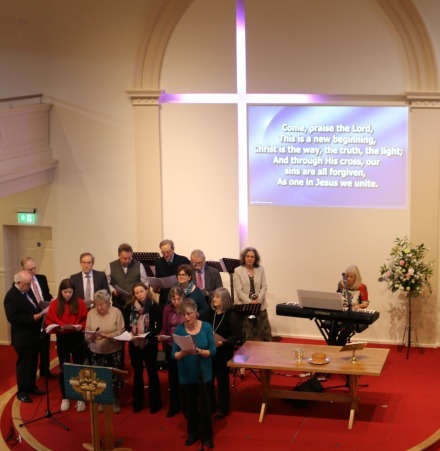 Last Sunday church members returned to worship there, and today (9th February 2019) there was a special re-dedication service. The church building downstairs was packed, and the large balcony almost full of people. 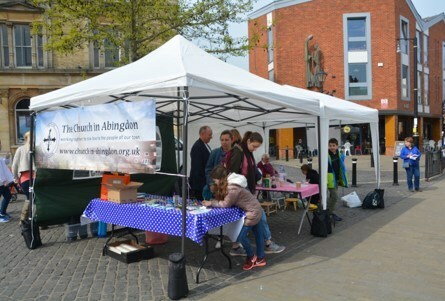 On the civic side there was the Mayor of Abingdon, Chairman of the Vale, and Councillors, two of whom are church members. 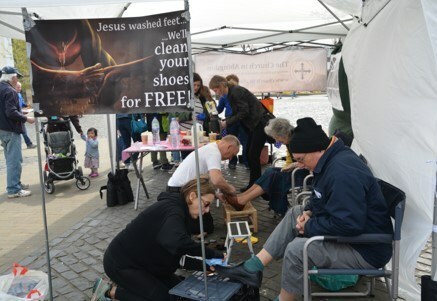 There were ministers and people from other Abingdon churches, and past baptist ministers including Revd. 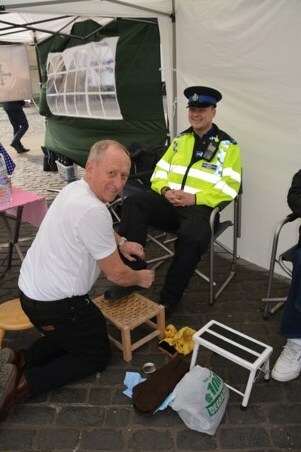 David Fleming who now serves in Luton. David Fleming spoke about the early vision of reordering the church. Revd. Dr Paul Goodliff, and the present minister, Revd. Steve Millard, then described how the plans had come together and been carried out. 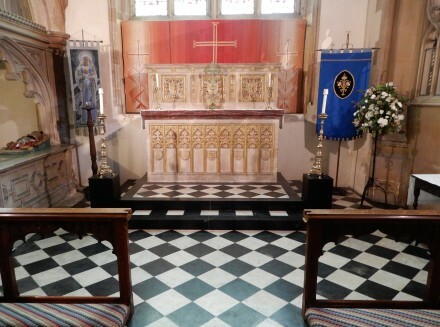 To re-dedicate the church, and give an address, was Revd. Lynn Green – General Secretary of the Baptist Union of Great Britain. She remembered being a student minister at Abingdon Baptist Church around 1992-3. She said a church could be like the Tardis in Doctor Who. It may look old fashioned and irrelevant on the outside, but inside it was bigger and so much more amazing. Back in 2015 the outside of the church was painted from sky blue to the grey colour required by English Heritage. Solid doors were replaced with glass doors to make the building more open. The church then closed in 2018, and builders brought a digger to dig out the old floor and baptism pool. During that process some old bones were discovered. 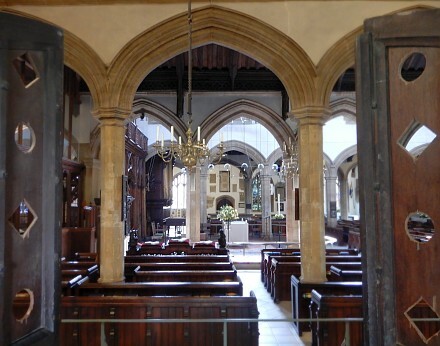 The police were interested until they turned out to be 200-year-old Abingdon baptists. They were reburied after an archaeological investigation. The church building has been made into a space that can be used for future generations, and the community. The floor and the stage, and baptism pool were remade. Walls were made good so the big crack is gone. 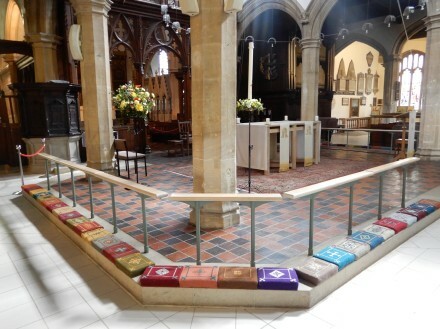 Pews were replaced with more comfortable flexible seats. There are some cinema style seats in the balcony – the best seats in the house. The interior is now bright and light. Lots of new cables have been laid to allow the latest and future technologies. 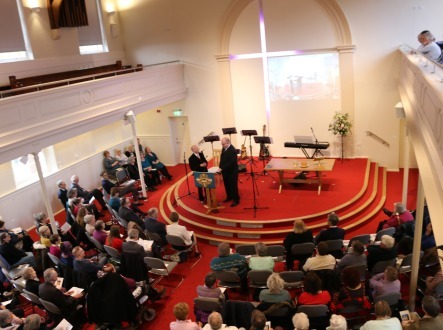 After the re-dedication service, tea and coffee and cakes were served. 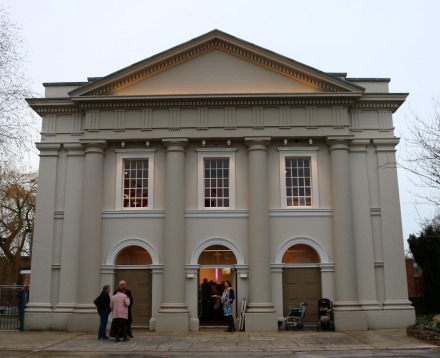 Abingdon Baptist Church (ABC) are on their travels while their church building is being revamped. Most Sundays they meet at Carswell School but on one Sunday a month they join with Trinity. 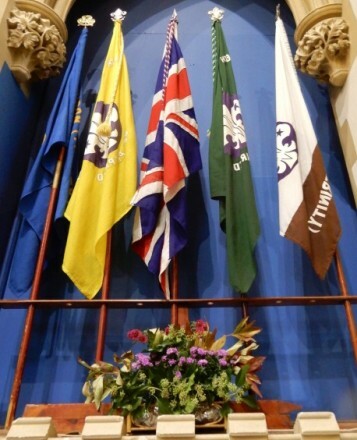 This morning was such a Sunday and coincided with the Harvest service and Parade Service. 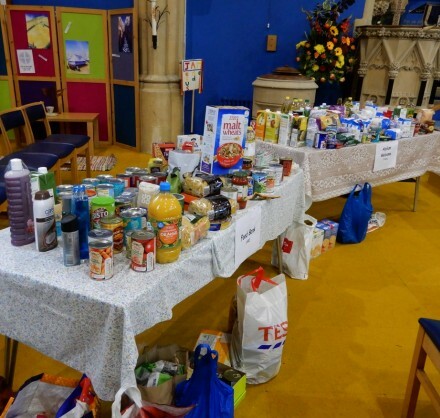 Donations to the harvest this year go to Asylum Welcome (for Trinity) and The Abingdon Food Bank (for ABC). 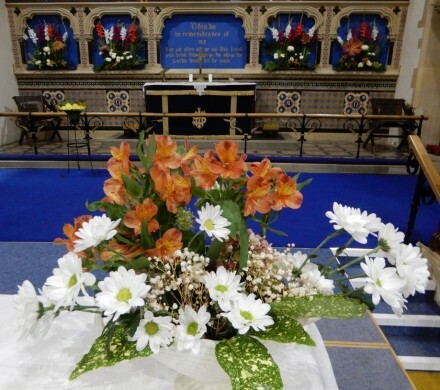 There were also some excellent flower displays all round the church done by people from Trinity and ABC. The church and balcony were full because the parade service brought uniformed groups from both churches together with parents. 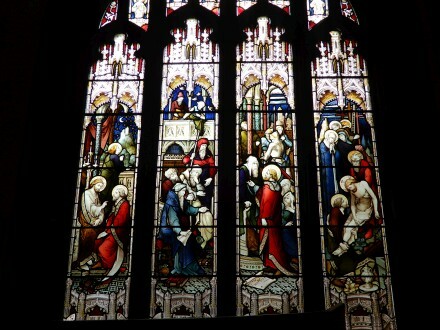 St Helen’s Church was open for visitors and for prayer on Saturday afternoon. I don’t think is has been open much during the winter months. I went in to have a look round. I got talking to the two ladies looking after the building. One told me that she lives in the almshouses and on Feb 18th felt everything shudder. She went outside expecting to see smoke or some sign of an explosion. There was nothing. Later she gathered from the news there had been an earthquake in Wales. My wife had a similar experience and she was in Bury Street. She also told me how her daughter came from Alaska. She had kept a £10 note to pay for the bus, but the bus driver would not take it as it was no longer legal tender. He said she could pay with her credit card instead but her card was not contact less. Then a young lady from the queue came and paid for her, the £3.90 to get to Abingdon. She said she was a Muslim and would not take anything in return. It was her belief that you helped people you see in trouble. P.S Apologies for only just getting round to approving about half a dozen comments some a few days old.